Wait… What? How did that happen? It seems like just yesterday we were swinging peacefully on the hook in the blissfuly remote Berry Islands of the Bahamas…. It all happened so fast I hardly know where to begin. 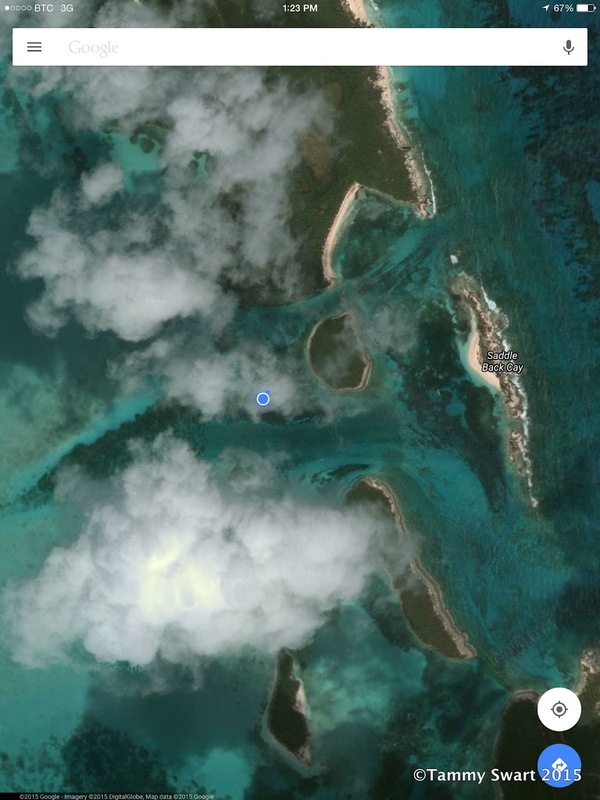 So we’re anchored in a nice spot tucked in behind Fowl Cay. Our idyllic private paradise was blown with the arrival of not one, not two… but three BABs to our anchorage. There were no boats left in the more popular anchorage at nearby White Cay… why didn’t they drop anchor there? Well, that would be because we were over HERE. And boats ALWAYS park as close to the existing boat in any anchorage as they can get. It is a well known fact. So… our bright idea to anchor well away from the other boats (who have since gone) in order to prolong our last Deserted Island fantasies… is a bust. Might as well move on. We still had two or three stops that we wanted to check out, but we knew we needed to kind of start wrapping it up. We were running low on water and it’s beginning to be a problem. The Berrys are pretty much everything that we THOUGHT the Bahamas would be. Islands devoid of people and amenities, littered with one beach after another, each more beautiful than the last. No dinner for you today, buddy! Wildlife abounds here in the form of birds and sea creatures. The birds have literally taken over many of these islands and will chase away anyone who trespasses upon their chosen rock. We’ve seen more rays and other dark hulks looming beneath our boat and dinghy here than in all the other places we’ve been combined. Actually there’s a funny story there. Our last day at Fowl Cay was meant to be spent exploring and snorkeling. We had just dropped the dinghy anchor in a nice bit of sand near a rocky point we wanted to snorkel. The dark shapes of rays ghosted beneath us and could be seen milling about aimlessly all over the place. What are they doing here??? There must be something that they are eating. I nervously prepared to go into the water while Bruce strapped on his mask and fins and suddenly plunged in. I scanned the water near us and saw a ray heading in our direction. I alerted Bruce, who peered beneath the water’s surface… and came back up sputtering and frantically clawing his way back into the dinghy. “It’s a SHARK! !” He managed to get this out with a quivering break in his voice as he fell back into the water, unable to drag his weight into the dinghy in his haste (read ’near panic’) to get his legs and other lower extremities away from the fish, who was lazily passing by. I couldn’t help it. I laughed. And laughed and laughed! That’ll teach him to be so brazen. A little caution never hurt anyone and he’s always scoffing at me for it. HA! Anyway… I digress. 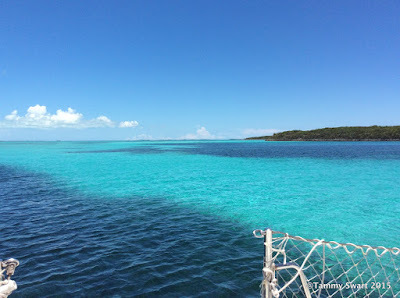 So we decided to pass on the Cabbage Cay anchorage and Flo’s Conch Bar, and head for Frasiers Hog Cay where we could pick some water and maybe even a bit of fuel. The wind was blowing stronger than it has for more than a week and we hoped it would die down and that the seas wouldn’t be too raucous. We hoped in vain. As soon as we began to exit the anchorage and motor between the reef extending south of White Cay and that stretching northward from Devils Cay, the waves began to really stack up. We were meeting walls of water that were higher than our deck and the boat would drop dramatically and then suddenly lift high into the air… only to plunge back down again. This made for slow progress initially and the cats got busy with the business of showing their displeasure. But the misery was short-lived and as soon as we got free of the cut and settled onto our course southward, things smoothed out somewhat. Unfortunately the wind was more south than east, making any attempt to sail impossible. So we slogged along and ticked off the passing cays, sizing them up for next year’s agenda. 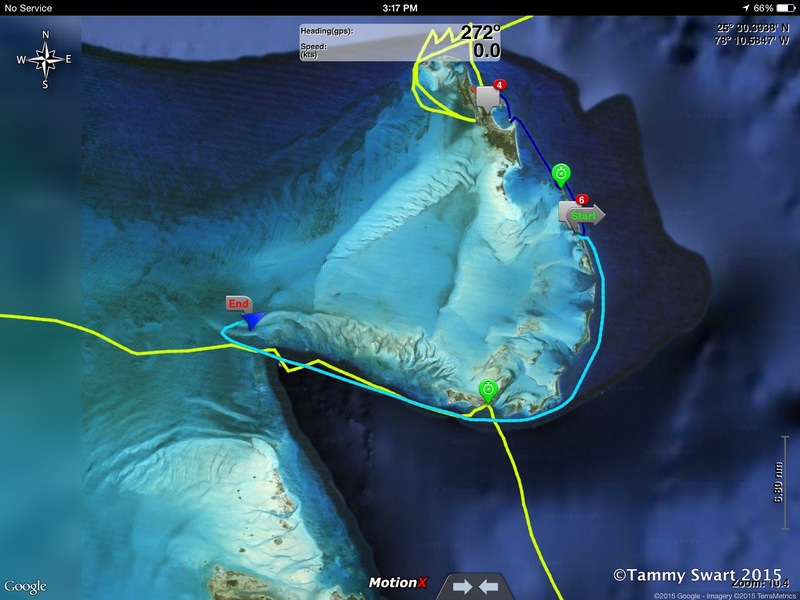 As we neared Frasiers Hog Cay, we hailed the Berry Islands Club on VHF 16. They answered and confirmed our fears that they did indeed… NOT have water or fuel for sale. We were going home. Wherever that is. In this instance it means the U.S. Back to the Land of Plenty where we can get clean. With this decision came a certain amount of sadness. But we couldn’t think about that. We needed to figure out where we would spend the night, and more importantly, where we could get some water. We tried hailing Chub Cay Marina and they didn’t answer. Screw ‘em. We had about 7 gallons of drinking water and seven more of water for washing. If we had to, we could make it all the way back to Florida on that. Up before the sun to continue on. 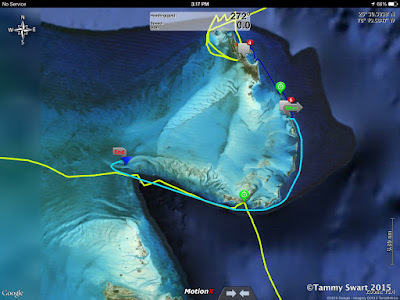 We chugged on past Chub Cay and slipped through the passage between the Northwest Channel and the Bahama Banks. Our plan was to tuck up behind the Northwest Shoal where we hoped to find flat water for the night. The banks can be pretty nasty in the wrong weather. The winds were relatively benign during the day, but we’ve been in a pattern of stronger winds overnight, which can really kick up the waves. We reasoned that they would be damped by the long stretch of shallow water. We were right. There was a bit of chop, but much less than than it takes to make us uncomfortable. We got anchored and talked about our day and our decision to hasten our departure. All in all, we’ve been lucky. The weather has been cooperative. Our optimism an appreciation for the fact that we are living a life as few people ever can has returned and we’re getting excited to return “home”. We made a list of the things we have missed the most. Communication with family, availability of boat parts, Mexican food, Netflix and (sorry) The Bachelor. And water. We came to the realization that had we installed a water maker before coming here, it would have been a totally different experience. Water maker installation has become a top priority on our list of things to do in the ‘States. Well on our way and enjoying the cool morning. Morning came and we were up and off across the banks with the sunrise. The wind was light but we sailed off our anchor. (I love doing that) It’s really funny. I think Bruce forgets that the engine isn’t on. He’s up there at the bow giving me the signal to move the boat forward. ??? So I turn the wheel hard into the wind and grab the mainsheet. 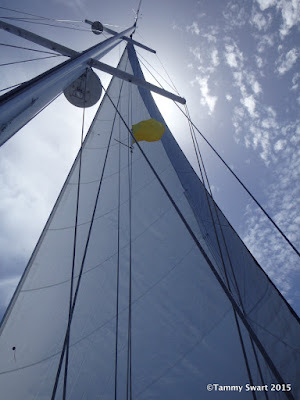 I give it a hard tug until I can feel the pressure of the wind on the sail. The boat starts to move slowly forward in the direction I’ve got the wheel turned. Then I let go of the sail and straighten out the wheel… he pulls in the anchor just like always. Bruce never noticed that the engine was off. We enjoyed our short-lived sail, making many adjustments and tweaks. The winds were light and variable… and dropping. 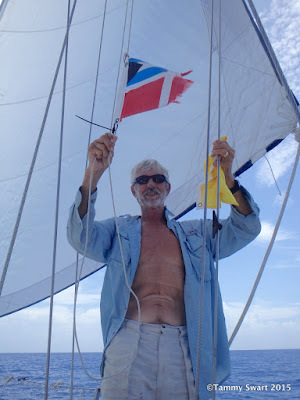 We eventually had to drop the sails and resign ourselves to motoring the remaining miles to Cat Cay. It was hot, but the ride was very easy and smooth. I’m not sure the cats even realized that we were underway. Or maybe they’re finally just getting used to it. Umbrella for radiating bimini heat and a 110 fan. Running the engine has its perks! We hailed the Cat Cay Yacht Club on VHF 16 as we neared the island. Unfortunately they closed at 5 pm… which is just about the time we would arrive. We would have to anchor out one more night with just a spit bath. 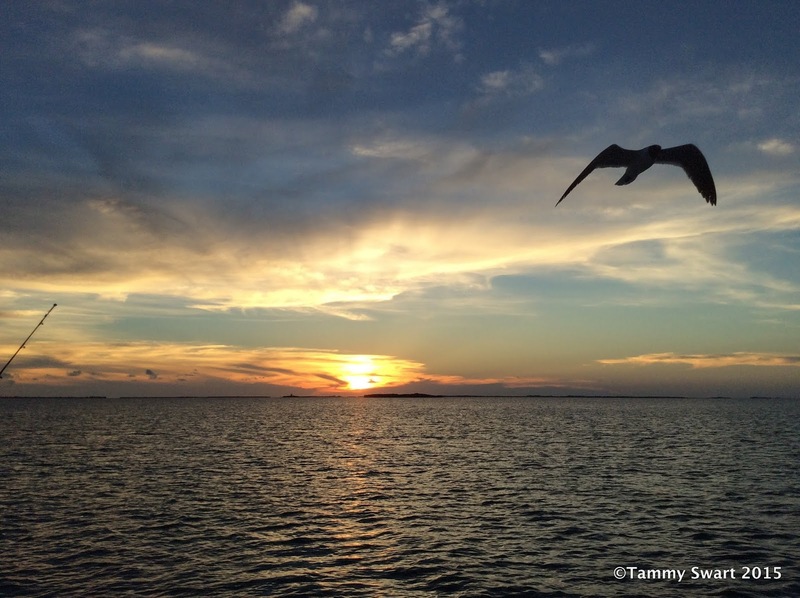 We dropped anchor outside of the basin behind another shoal and enjoyed our evening. We had made it. 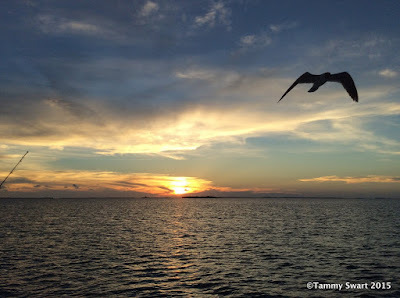 We were poised on the very edge of the Bahamas ready to leap back across the Gulf Stream. 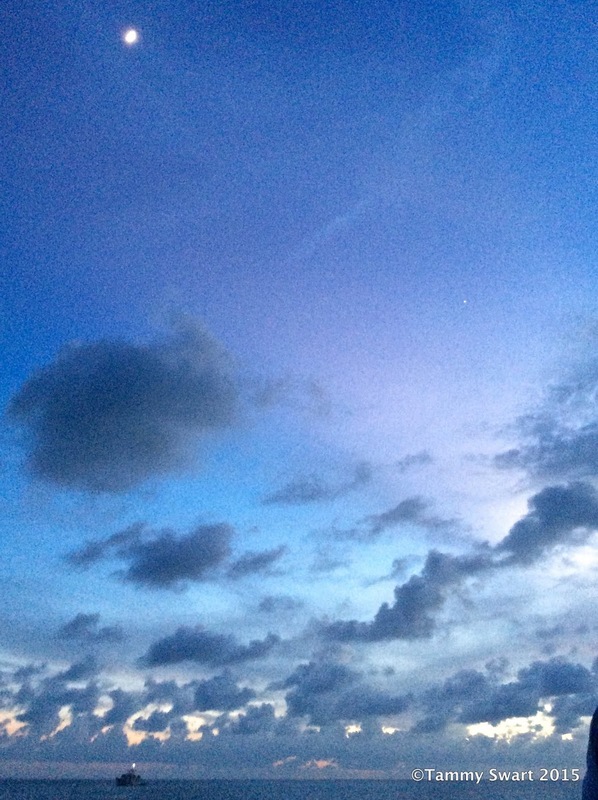 Our last Bahamian Sunrise... for this season! We marveled at the lack of angst this produced in us this time around. There was none. Zip. Zero. Nada. So far had we come from those nervous and scared Newbies of four-and-a-half months ago. It felt really really good. Even the thought of sleeping on our dirty sheets one. more. night… couldn’t dampen our spirits. The shoal did a marvelous job of providing us with a calm and peaceful night’s sleep. We were up before the sun, sitting in the cockpit just drinking it all in. I felt like I needed to pack as much of the beauty of this place into my brain as I could, because we would be in for a long dry spell. We moved the boat to the fuel dock at about 7:30. We wanted to be the first in line. We easily docked with no help and settled in to wait for the attendant. Our wait proved to be long… and when he finally did get there, he fueled up the guy on the lawn mower and the local fisherman first. No worries. We really didn’t care. We've grown accustomed to Bahama Time and knew we had an easy day ahead of us with plenty of daylight for the crossing, even with a late start. Once we had our turn at the fuel dock, we just started the engine and left. That was it. Motored easily out through the pass into the big water. It was just that easy. We rolled out the jib for some stabilization, but the seas were very benign. The cats were happy, we were happy. We enjoyed a totally uneventful ride BACK across the Gulf Stream. That same Gulf Stream that had once caused me so much mental distress… no more. 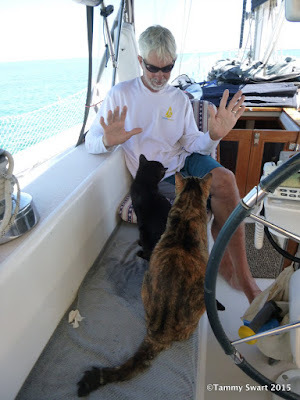 By mid afternoon we were adjusting course to fine tune our approach to the outer markers of the Cape Florida Channel. We had come full circle. I was following our track on the iPad laid down some four and a half months ago in the dead of night. By the same path we had left, we now returned “home”. So many things were running through our heads. We were sad that our time in the Bahamas was done. But we were proud that we had DONE IT! Quarantine Flag up until we called to check in. We're within CELL PHONE RANGE!!! Navigational Aids... Oh how I have missed thee! The goal of so many year’s work was in the books. It was accomplished. Now what??? At this point, we honestly don’t know. We anchored the boat within feet of the spot we had anchored on that night before this all began. We had our dinner on the aft deck gazing at the grey skies and glassy flat water where no breeze stirred. I struggled to find the beauty in this scene that once pleased me. I’m spoiled by the iridescent sparkle of Bahamian waters. But gradually as I sat there enjoying the end of this homecoming day, I let the beauty of it in. We heard familiar birds and the voices of people enjoying the park on the shore nearby. We rode the wake of the many speedboats zoom-zooming by us. This is Florida. There are a zillion people. It will be a long time before we can even imagine ourselves to be the only people around for miles again… But we are happy and excited to see what the summer holds. We have a wedding and get to see our girls again. We can talk on the phone and watch movies… We can eat MEXICAN FOOD!